Calling 999 is for emergencies only. 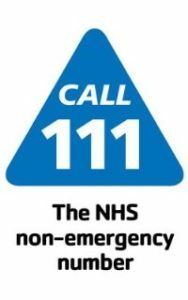 NHS 111 is for people who need medical help and advice when not in a life-threatening situation. Highly trained advisors, who are supported by healthcare professionals, are available on NHS 111 24 hours a day, 365 days a year. When should you call 111? For less urgent needs, please contact your GP or pharmacist. Find out more about NHS 111 on the NHS choices website. Our highly trained call handlers can determine whether your condition requires 999 assistance and arrange for an ambulance crew to attend you, or offer you medical advice which could include visiting your GP, pharmacist or local walk-in centre. Click here to visit our Choose Well pages and find out about the other health care services available to you when it’s not an emergency.